Some things are illustrated so often, that we accept visual shorthands or technically-incorrect representations because of how familiar we are with them, as standards. Without makeup, men and women have essentially the same lips, but we delineate between male and female lips, in line art, with subtle (and not subtle) coding. There are ways to represent alien, to represent invisible, without having to append text clarifying, “invisible here,” that just become part of our unquestioned visual lexicon, until we have reason to question them. Then, they’re weird. I can only think of two comics, off hand, wherein invisible people or objects are illustrated by not showing them at all. In every other case, there is a dotted outline, or a coloring effect, a “Predator” blur, or some other indicator of invisibility. Reasons for showing an invisible form, include very simply, that many comics want to communicate invisibility at a glance. 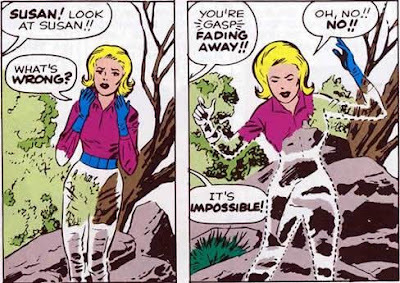 Particularly, with superhero comics that are aimed at creating a sense of action and the eye does not often linger on panels, a dotted outline can be immediately read as invisibility while giving the reader something to focus on, something they can clearly identify as a woman or a spaceship. 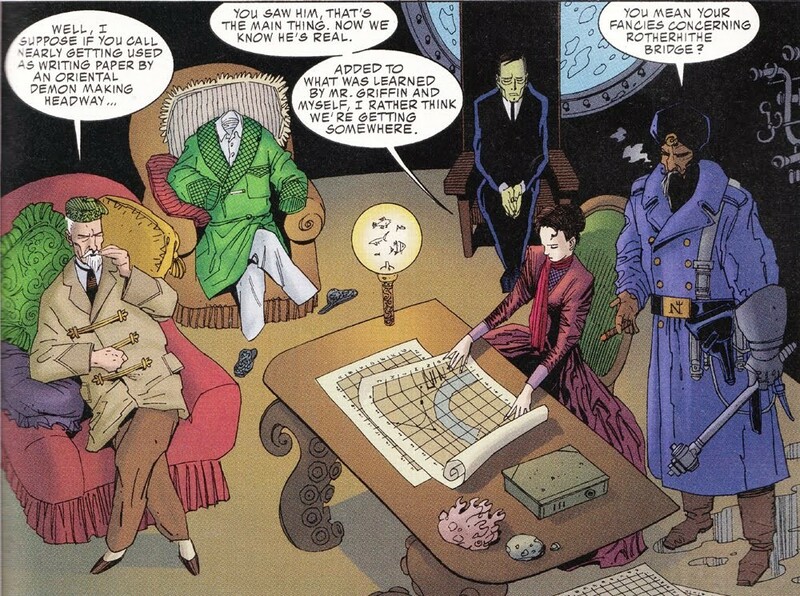 The two examples of invisibility without delineator, that I can think of, are League of Extraordinary Gentlemen, which is both talky and a stare-at-the-panels comic, with lots of visual references and encoded material, and Fantastic Four: 1234, which primarily used invisibility in a dinner conversation which carries a heavy tone of being ignored, feeling absent. So, does there need to be an overriding reason to show invisibility as being invisible? 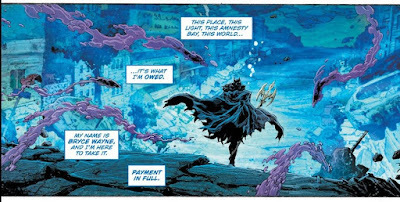 More than nine times out of ten, characters underwater in a comic, swim if they are in a lake or near the surface of the ocean, but the lower they get in the water, and almost aways, if they live in underwater, they treat the water as if it is air atop a dry surface. People drink out of open-mouth cups under the sea in comic books. They lounge in chairs at the bottom of the ocean, and I don’t mean just in kids books or something extremely cartoonish. Almost all of them. Hair does not flow. Legs don’t float up. The “crushing depths” of the ocean floor hardly ever put pressure on anything, or even present a problem. And, they are always sufficiently lit for human eyes. 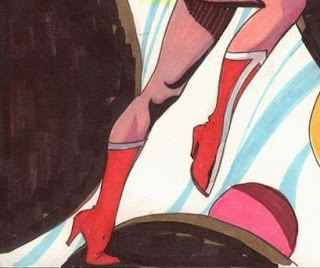 What is it with superhero artists, in particular, and an inability to draw the left and right heel on a pair of heels, the same? Same shape. Same height. I am almost surprised the colorists will remember to make them the same color, the way the pencilers and inkers go at it. I won’t name names, but one superhero artist who also does painted commissions, manages to paint trademarked characters (not his) with mismatched heels, or one heel, one flat, so often I almost think he’s doing it as a joke. Pretty much, an adult over twenty-five stays the same height, until they are old and start to shrink, or something unusual occurs. Wearing high-heeled shoes or platforms can make you appear taller, as can the angle a person is viewed at, but kissing someone cannot change your height; beating someone up cannot change your height. Unless you’re a monster who changes shape or changing size is your superpower. And, if it is, that probably should be addressed in-story sooner than later. Artists get so used to drawing a man kissing a woman as towering over her, even if the woman is definitely taller or standing on higher ground, standing while he is sitting, because we are all used to seeing it in entertainment. Real life? Not so much. In real life, for the average man to kiss the average woman on the lips while she is standing and he is sitting, he must angle his face up to her. If a vampire or werewolf magically take on an animal form, that’s magic. But, if someone is supposed to be aging super-fast due to “science,” how hard is it to communicate that by reasonable corruption of the body, and not a cartoon of old-person-ness? If someone is physiologically changing to gain muscle mass, fur, or a rocky exterior and changing their number of fingers per hand, show it. An altering number of fingers or toes, alone, has got to be a substantial thing to undergo. Draw it! If someone is physically, phenotypically sprouting new shocks of sudden hair, and then they revert, how do they revert to an old haircut? 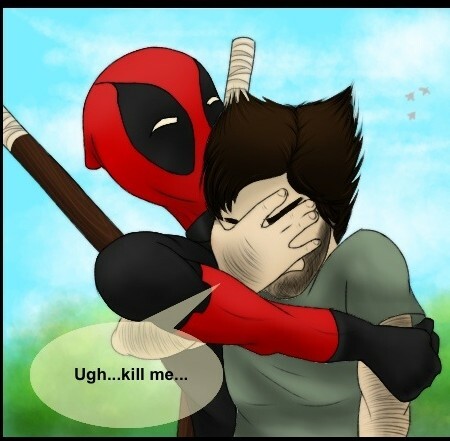 Maybe Wolverine’s healing factor constantly styles his hair, but Ben Grimm? How does Ben Grimm get his haircut back when he un-Things? 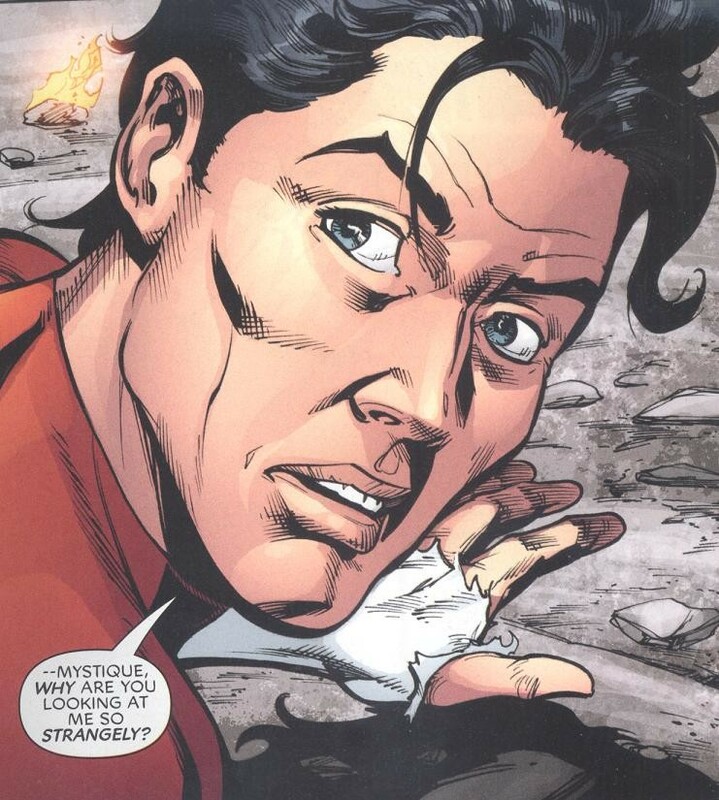 If Nightcrawler un-mutates and has normative human hands, are there callouses on any of the fingers?